Can cranberry in feed reduce chick mortality? Cranberry has long been touted as a booster of the human immune system — and it turns out that benefit may also apply to chickens. Agriculture and Agri-Food Canada research scientist Moussa Diarra has been exploring cranberry as an alternative to antibiotics during the critical first weeks after hatching. “In conventional poultry production, we use antibiotic right away from Day 0 to Day 35, and there is a reason for that because young chicks, or young birds, are really more susceptible to infection,” he said. Research has shown that chicks are vulnerable to a wide range of diseases, from E. coli-caused colibacillosis and rot gut (an illness commonly treated by antibiotics), to infectious bronchitis, fungal brooder pneumonia and salmonella, the root of a recent health scare which led to 13 human cases and four hospitalizations over four provinces in Eastern Canada. For several of those threats, early antibiotics are critical. At the same time, the industry has been caught up in the same public push against antibiotic use as the beef industry, concern based largely on the idea of “superbugs,” bacteria that have become resistant to antibiotic treatment because of excess antibiotic use in the rest of society, including meat production. In May 2014, the Chicken Farmers of Canada banned Category 1 antibiotics — drugs that are the most important for human health and have few alternatives — for preventive use. The move was expected to increase mortality on some farms, at least in the short term, experts said at the time. The national poultry group will take things a step further next year. Category 2 antibiotics, those used to treat serious infections but that generally have alternatives, will be phased out by the end of 2018, while Category 3 drugs, those of medium importance, will join the banned list by the end of 2020. It is Diarra’s hope that at least part of that gap can be filled by adding cranberry to feed. In a study published in Poultry Science in 2010, Diarra tested different concentrations of cranberry powder on 1,200 male Ross chicks during the first 35 days after hatching. Chicks were fed 40 milligrams, 80 milligrams or 160 milligrams of cranberry juice per kilogram of feed, compared to a control group which was not exposed to the berry. He found that adding 40 milligrams of cranberry juice powder per kilogram of feed could lower early chick mortality by as much as 50 per cent and resulted in the lowest total mortality off all four groups — 5.2 per cent, compared to 6.9 per cent in the control. As to how popular feed was with the birds, Diarra said there was no evidence that the addition of cranberry put chicks off their feed. Diarra’s study finished off with a look at finished meat. The berry influx had no negative effect on meat quality and no positive influence on growth, Diarra found, although he hopes to eventually explore whether the benefits in live chickens might translate to more shelf life in meat. Higher concentration results saw the highest total mortality. A total 9.5 per cent of chicks fed at the 80 mg/kg concentration and 11.1 per cent of chicks at the highest concentration died. The story shifted when data was broken down by cause of death. Mortality in the higher concentrations was largely caused by culls (runts, rotated tibias and other bone and muscle issues), which accounted for well over twice as many deaths as in the lower concentration. The highest concentration also saw a highest number of sudden death syndrome, ascites, heart failure, and unknown deaths. Early morality, however, fell. While not as low as in chicks fed the 40 mg/kg concentration, death from yolk sac infection, omphalitis, crossbeak, starve-out, and dehydration still sat well below the over four per cent of chicks that died of similar causes in the untreated control. Diarra has since seen “promising” results in trials using cranberry pulp, or pomace, rather than commercially bought juice powder, but he has yet to publish his data. The researcher began to explore pomace after finding that the pulp left over after juicing has many of the same traits that attracted him to cranberry in the first place. “We realized that this leftover was even richer in polyphenolics (micronutrients with antioxidant activity) than the juice itself,” he said. Diarra is currently looking at cranberry “press cake,” a pomace product that his lab produces in house. In a study published in 2013, Diarra’s team compared two different methods of extracting juice from cranberry pomace and found that press cake extractives topped the phenolic acids and antioxidant activities of juice power by three to four times. Flavonols and anthocyanins, both antioxidants linked to higher immunity, were five to 10 times higher. “We realized that the extracts from those press cakes were a good source of polyphenolics, very concentrate(d) and impacted bacteria grow(th),” he said. Despite his promising results with press cake, the treatment itself would be costly for farmers. His team moved from juice to pomace partly due to cost, since pomace was considered waste at the time. Since then, however, processors have begun to market the pulp for things like pet food. Diarra estimates sourcing pomace from a processor at $4 per kilogram. His findings on pomace will likely make their way into a future paper, he said. Diarra’s research has easy ties to reduced antibiotic use and organic farms, but it is unclear if any producers have actually turned it into practice. The Manitoba Chicken Producers says it is aware of Diarra’s research, but so far has not heard of any producers using cranberry. “Really, that research sort of was promising and we got some good results there and it really went nowhere for about five years,” Blake Johnston, chair of the Canadian Cranberry Growers Coalition, said. 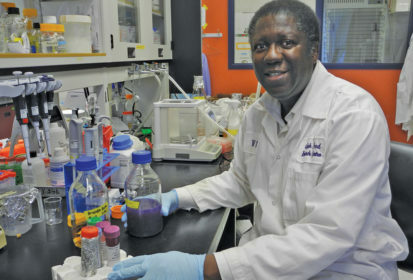 The Canadian Cranberry Growers Coalition helped fund Diarra’s initial research. Industry’s less than exuberant response has not stopped Johnston from being hopeful, however. The cranberry grower pointed to the growth of antibiotic-free, but not fully organic, chicken on the market, something that he says has grown since the first research was published. “It’s clear that the consumer is interested in a product that has less antibiotics, for example,” he said.